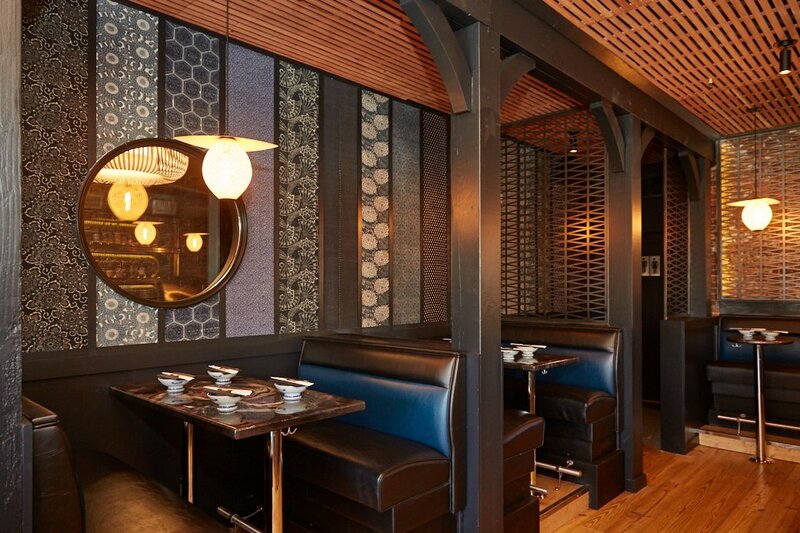 There’s a lot happening at Zeppelin, Shaw’s haven for Japanophiles and karaoke fans opening Monday, March 4. 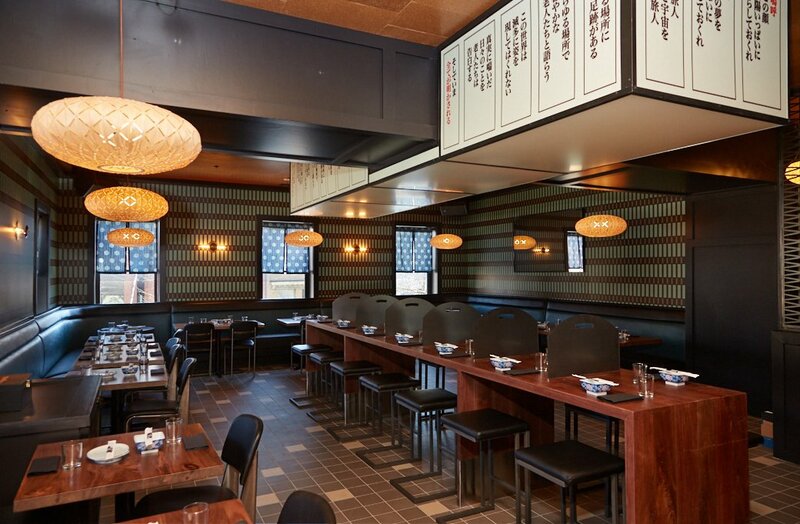 The two-story dinner, drinking, and nightlife venue, located in the former Shaw Bijou space, is the kind of place you could come for a few Sapporos and yakitori skewers or a $150 omakase menu—and wind up belting out David Bowie tunes in the wee hours either way. “These days it’s not enough to just open a cocktail bar. You have to set a stage,” says co-owner Micah Wilder. 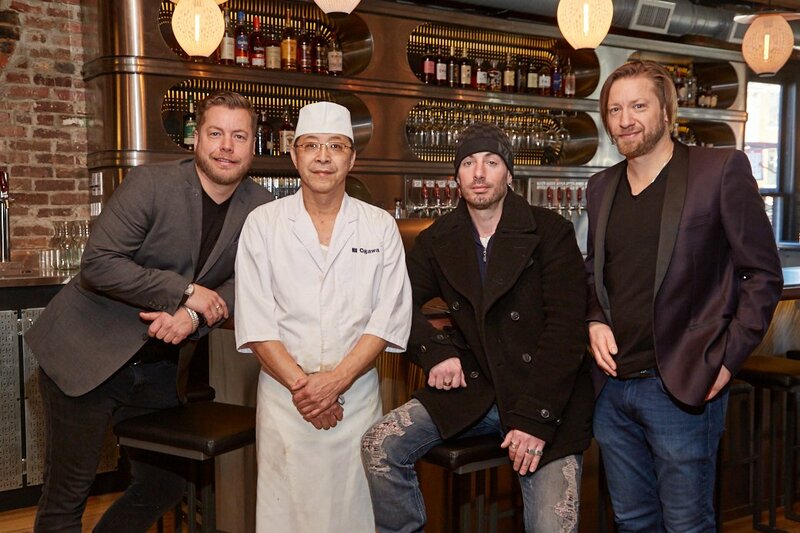 Wilder and his brother Ari Wilder have teamed up with their business partner in nearby Chaplin’s, Adrian Williams, as well as veteran Japanese chef Minoru Ogawa of Sushi Ogawa for the new venture. Micah first met Williams and Ogawa working at Dupont’s storied sushi/karaoke dive, Cafe Japone, over a decade ago. The first floor cocktail bar and its Suntory Highball Machine. Zeppelin, a nod to the 20th-century German airship, was originally destined to launch on the rooftop of Chaplin’s before permitting issues (hence the name). Location aside, the cozy 20-seat cocktail bar near the entrance is designed by New York’s Reid & Taylor Studio with the “golden age of air travel” in mind to give the feel of an “airship cocktail party,” says Micah Wilder. Dining nooks in the cocktail bar where the full sushi and Japanese street food menu is offered. The team sourced a variety of Japanese spirits, including a rail vodka made with Japanese rice and a gin distilled with yuzu. We have our eye on “Chesterfield” cocktail with whisky and pineapple-infused anise liqueur. The drink is chilled with smoked “yakitori ice” (made by smoking water alongside the yakitori) and then garnished with a meaty skewer. The outdoor patio will have 65 seats and a window to the bar in warm weather. 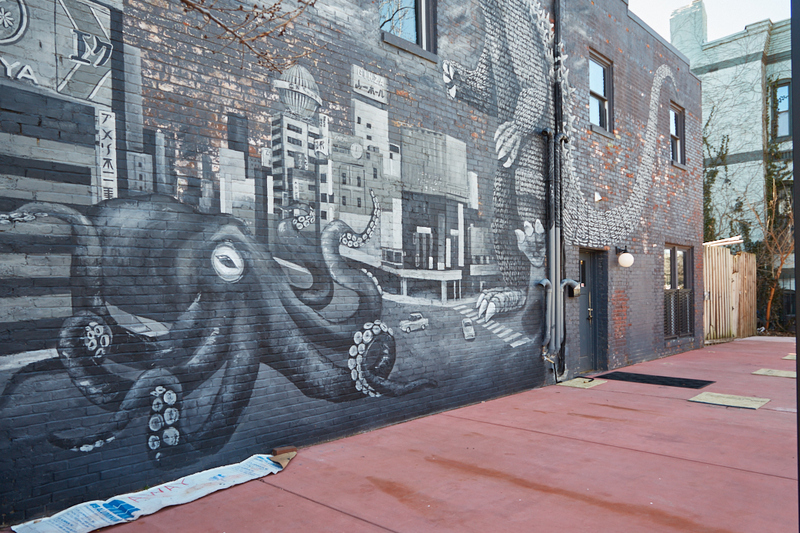 When the weather warms and the patio’s cherry blossom tree blooms, there’ll be 65 outdoor seats for the taking. Guests can order drinks from a flip-up window to the bar. 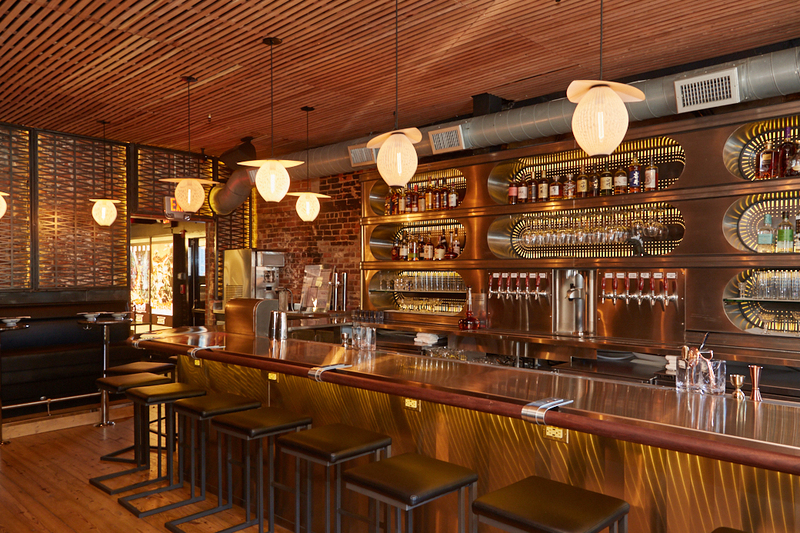 The beer list is made up of Japanese labels (big and small, such as Kizakura ales from Kyoto) as well as Japanese-inspired drafts and bottles, including a salty and sour plum cider the team commissioned from Maryland’s Distillery Lane Ciderworks. The sake list runs around 80-deep and spans the spectrum from an approachable $35 bottle of aptly named Sugei “Drunken Whale” Tokubetsu Junmai to an elegant and perfumed $362 Kikusui Kuramitsu. 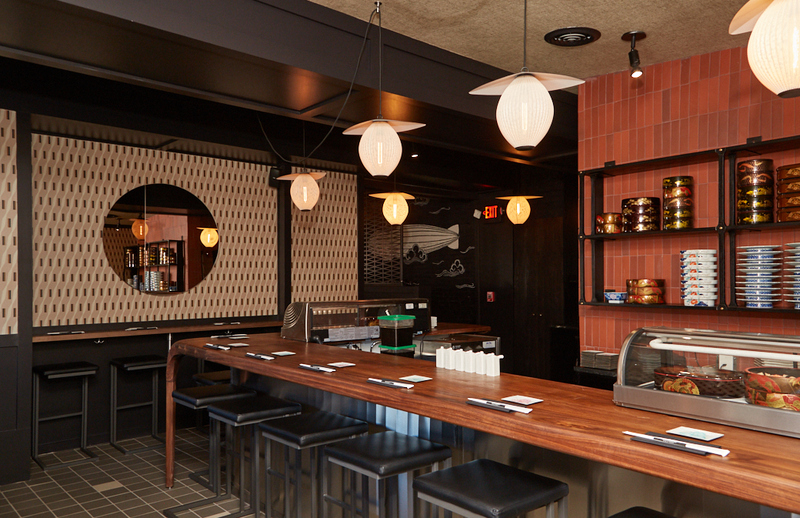 The second floor dining room transforms into a communal karaoke room in the late evening. Climb Zeppelin’s stairway (without getting “Stairway to Heaven” stuck in your head) for the 65-seat dining room. Here you’ll find an izakaya-style menu filled with skewers, tempura, donburi rice bowls, shumai dumplings, takoyaki (octopus balls), and other drink-friendly fare. The 21-odd yakitori items are cooked on a Japanese binchō-tan charcoal grill and include crowd-pleasers like chicken with scallions alongside gizzards and beef tongue. 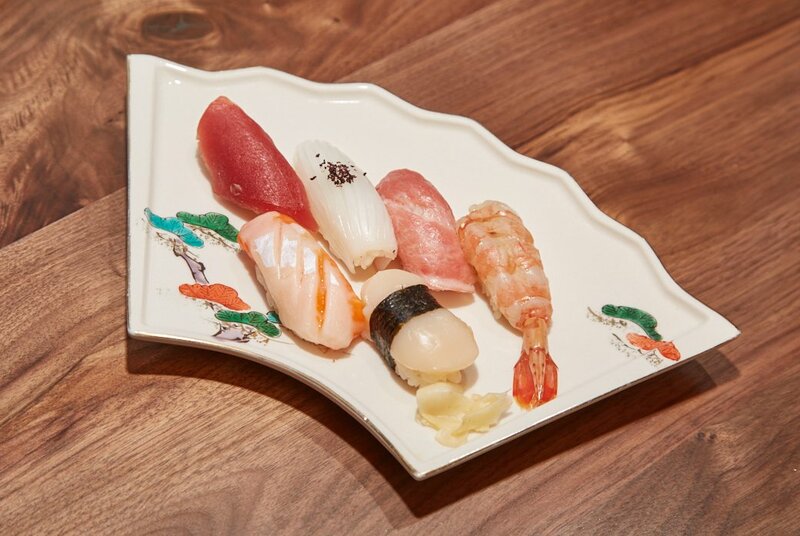 Ogawa, a Tokyo native and revered second-generation sushi chef, isn’t straying from his traditional edomae style for the dining room sushi and sashimi menu (so no spicy crunchy Philadelphia rolls here). His fish is often imported from Japan and presented in a minimalistic fashion over slightly warm, seasoned sushi rice and perhaps a brush of homemade nikiri (sweet soy sauce) or dab of minced ginger and scallions. 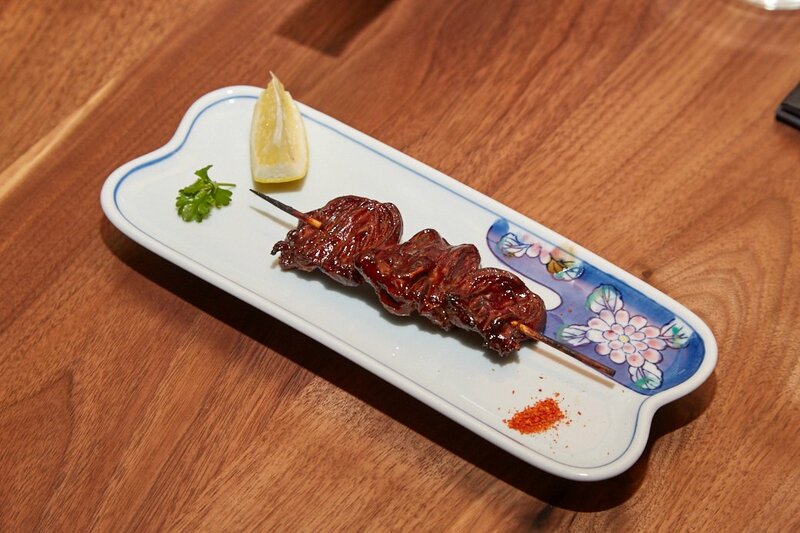 Over 20 yakitori skewers fill the menu (pictured: charcoal-grilled chicken hearts). The dining room sushi menu includes simple sets of sushi, sashimi, and rolls. Karaoke begins around 10:30ish in the dining room. This isn’t exactly the place for shy singers—two big flat-screen TVs play videos, while cordless microphones are brought to patrons’ tables to belt out tunes to the crowd. (There’s a $10 food/drink minimum per singer.) Songbooks include over 30,000 titles in English and Japanese. Fish is flown in regularly from Japan. 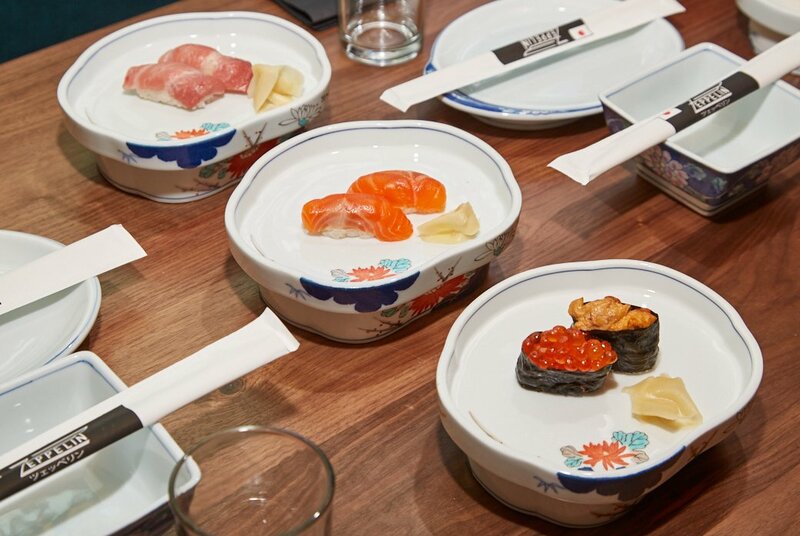 The 12-seat omakase counter hosts two seatings per evening. Zeppelin will become Ogawa’s new home base for now. He’ll prepare three omakase menus at the 12-seat counter: a $65 option with 15 pieces of nigiri; an $80 menu with the addition of appetizers, clam miso soup, and dessert; and a $100 splurge that tacks on all of the above plus a hand roll and sashimi. Each option includes seasonal fish and house dry-aged tuna. Eventually, the team plans to add a $200 option with specialty beverage pairings including high-end sakes, cocktails, and a small bottle of Johnnie Walker Blue, Japan’s most popular whisky, as a parting gift. It’s exactly the liquid courage you’ll need for post-omakase karaoke. Zeppelin. 1544 Ninth St., NW; 202-506-1769. Open Sunday through Thursday, 5 PM to 1:45 AM; Friday and Saturday, 2:45 AM. Zeppelin partners (left to right): Ari Wilder, Minoru Ogawa, Adrian Williams, Micah Wilder.